Varming Consulting Engineers were commissioned to design the electrical services installations for the decorative lighting installation on the Boyne Valley Viaduct. The viaduct carries the main Dublin to Belfast railway line and was originally constructed in 1885 and spans the River Boyne at Dundalk. 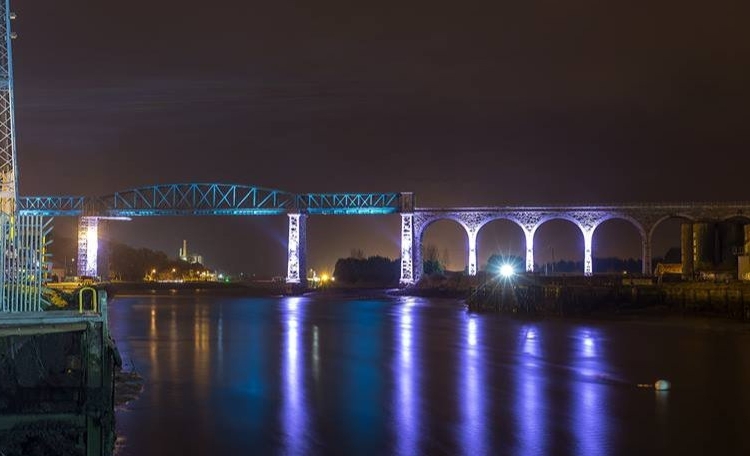 The lighting installation was an element of an overall refurbishment of the stone and steelwork of the viaduct in 2015, financed from a European Regional Fund in support of cross-border activities. The viaduct consists of 18 No. spans (arches) and 20 No. piers. Phase 1 of the lighting project consists of the illumination of 8 No. piers in the middle of the viaduct where it crosses the river. The scheme is designed to be expanded to illuminate all the piers in the future. Each pier is illuminated by a wide beam LED floodlight facing upwards to illuminate the upper portion of the pier and the arches to each side of the pier. A second floodlight (narrow beam) is at the same position but facing downwards to illuminate the low portion of the pier. The floodlights are colour changing and pre-programmed at a local control station (with remote access facilities) to colour change to match time of the year, festive and special events. 14 No. floodlights; each 4,000 lumen; 2.8kW total load; colour control by DMX / Ethernet.